Above: Advertisement in Lancaster City Directory for 1888, printed by the New Era Book and Job Print Shop. Above: Portrait from 1883 History of Lancaster County, Pennsylvania, by Ellis and Evans. Jacob Miller Willis Geist was a powerful kingpin of Victorian-era publishing here in Lancaster County. His New Era newspaper was the most-read and most-influential newspaper in the region. ...and his job-printing business had the best presses and the most customers of any shop around. 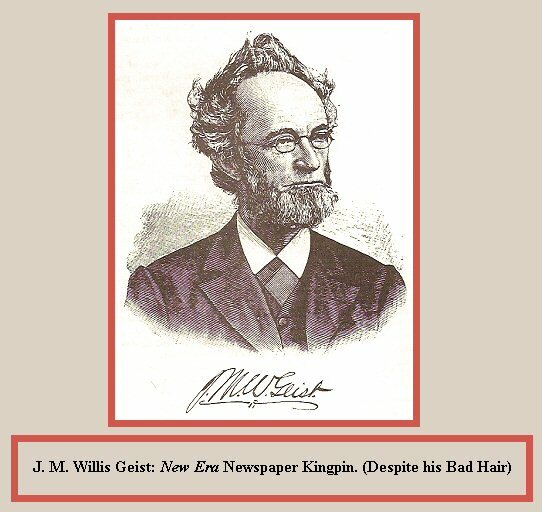 J. M. W. Geist ruled the roost. J. M. W. (he mostly used his initials, but I think of him as Willis) is an all-American success story of a young printer, from "humble birth," who catapaults himself into the highest strata of local power and influence. Willis was born (1824) into a Pennsylvania-German / Scots-Irish family in Bart Township, Lancaster County, PA. By age 16 he became the teacher of the same school where he had recently been a pupil. At age 18 he moved to Philadelphia where he learned the printer's trade. Two years later he returned to Lancaster, where his printing and publishing career skyrocketed. Within 6 years Willis paid off his New Era loans, and doubled the size of his print shop. Above: Portrait from the 1903 Biographical Annals of Lancaster County, Pennsylvania. Meanwhile, Willis had created the Lancaster Republican party, where his New Era newspaper held court. His greatest printing and political rival was the life-long Democrat Andrew Jackson Steinman, whose Intelligencer Printing Company published the Intelligencer Journal directly across the street from Willis, on Penn Square's opposite corner at 8 South Queen Street. Steinman's sons eventually purchased Willis's New Era newspaper, in 1928. By that time, the New Era Company had moved into the New Era Building in the first block of North Queen Street. 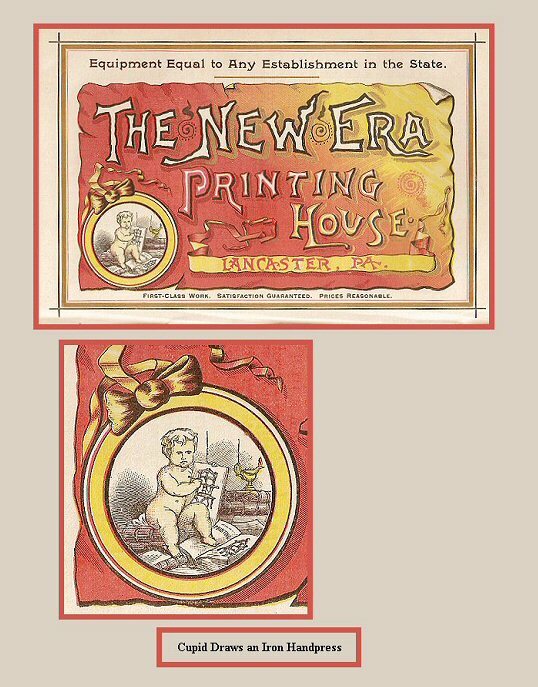 Then the New Era job-printing shop morphed into the Lancaster Press, on North Prince Street. Finally, in 1929, both the New Era newspaper and the Intelligencer Journal moved into their current home on West King Street, where the Steinman family publishes those papers today. Images are from the Lancaster City Directory for 1888, printed by the New Era Book and Job Print Shop. 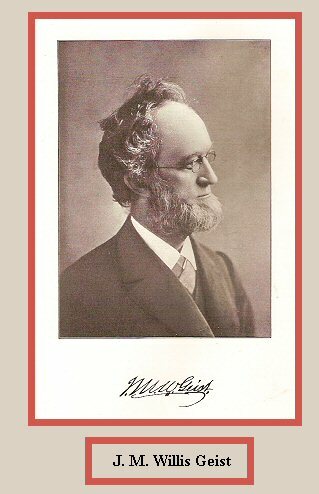 Andrew H. Hershey was superintendent of the New Era Printing House's book and job printing department in the late 1800s...and became part owner of the company. His enthusiastic taste for the most current, cutting-edge typography suggests he was a real fan of Arts-and-Crafts-era design. Andrew's design sensibility was influenced by that era's leading arbiters of fine-press style, including William Morris and Elbert Hubbard. Andrew's personal library included a set of Roycroft books signed by Elbert Hubbard. Lancaster may have been somewhat provincial here, in the 1880s, but we were no backwater. Andrew Hersey's exuberant typography positioned the New Era print shop on the leading edge of graphic design. The New Era Printing House: Fast Forward into 1901 ...and into 2007. Willis Geist's New Era Printing House was a showcase of state-of-the art typography and state-of-the-art machinery. In 1877 Willis brought the first rotary printing press to Lancaster, to print the first issues of his New Era newspaper. In 1890, Willis and his business partner John Warfel, moved their New Era company from the southeast corner of Penn Square ( today's Watt and Shand site) to the New Era building in the first block of North Queen Street. The next year they installed Lancaster's first electricty-powered printing press, a Goss Web Perfecting Press. The New Era was one of the first American newspapers to be printed on this press. 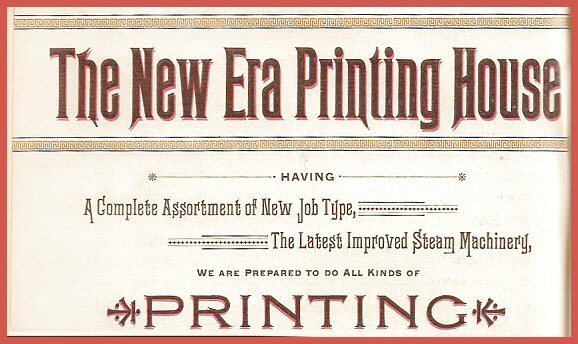 The New Era printers began printing longer runs and big editions, in quantity and quality that was unthinkable a few years earlier. Willis may have spent most of his time in the front office, but he had no problem getting grease on his hands. "He always selected and supervised the erection of the machinery used in his business, even to the minutest details." (History of Lancaster County, Ellis and Evans, 1883.) He preferred tinkering with printing presses to "lounging at a summer resort." Willis Geist got the job done. Above: The Lancaster New Era nameplate (or masthead), today. In 1928 the New Era was purchased by John Frederick Steinman and James Hale Steinman, the two sons of Willis Geist's business-and-political rival, Andrew Jackson Steinman. The Steinman family continues publication today. The Lancaster New Era is Pennsylvania's largest-circulation afternoon newspaper. The online New Era is Here. P.S. Thanks to John H. Brubaker, III for being the definitive historian of the Lancaster Newspapers. Some of my New Era information comes from his 1984 book The Steinmans of Lancaster. Above: George Michael Steinman was one of Lancaster's most prominent businessmen. He operated Steinman Hardware, at the site of today's Pressroom Restaurant, my favorite newspaper-themed restaurant. The restaurant is Here and Here. George Steinman was half-brother of Andrew Jackson Steinman. In 1866, this A. J. Steinman would be the first Steinman to enter the newspaper business, when he became co-publisher of the Lancaster Intelligencer with Henry Smith. That one billhead, above, shows that George Steinman purchased some of his printing from the New Era Printing, rather than from his half-brother's Intelligencer Print shop. But perhaps George also purchased printing from his half-brother; George's other billhead and trade cards do not identify the name of the print shop. The color chromolithography of the trade cards probably was not printed by a Lancaster printer, although the text presumedly was printed here. Above: Horses abound, here in Lancaster County. Always have. Always will. Amish horses, Mennonite horses, show-ring horses, dressage horses. Every week, hundreds of Amish and Mennonite horses trot up and down our highways, in placid defiance of the 21st century. Hundreds and hundreds of self-confident horses, pacing neck-and-neck with SUVs and eighteen-wheelers. Some of my favorite 19th century Lancaster billheads (if it's possible to have favorite billheads) are the 1880s and 90s forms that are printed with equestrian cuts ...often accompanied by overwrought Victorian typography. Most job printing does not identify the printer, including these horse billheads. So I decided to include these horses here on the New Era page; I assume that some of these forms were printed by the New Era print shop or by the Intelligencer shop.